Cazenovia College Visual Communications Adjunct Instructor Randy Elliott has contributed original inked art from a Scooby-Doo Where Are You? comic book to a charity auction event to benefit victims of the recent hurricanes in the gulf states and Puerto Rico. The "Thanks + Giving" Auction was organized by the National Cartoonists Society and the National Cartoonists Society Foundation, in partnership with Heritage Auctions. Hundreds of cartoonists have contributed art for a one-week auction that will take place beginning on Thursday, November 23. Many daily comic strip artists will mark the event in their daily strip that day, and will donate the art for that day's strip to the auction. Elliott teaches the Storyboarding course in Cazenovia College's Visual Communications program. He's also a widely recognized cartoonist who currently draws the Scooby-Doo Where Are You? comic book. His previous work includes stints drawing Bionicles, Archie and The Amazing Spider-man comic books, and several Magic: The Gathering trading cards. Elliott is a member of the Upstate New York Chapter of the National Cartoonists Society. 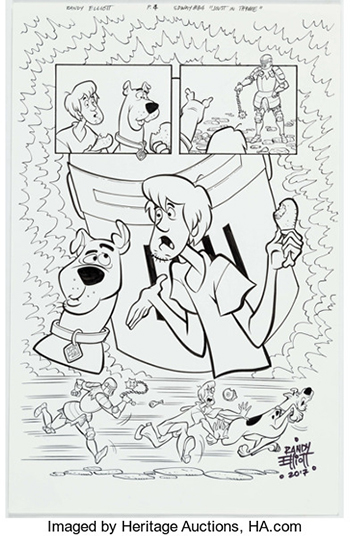 He contributed his original inked art for pages 3 and 4 of Scooby-Doo Where Are You? issue #84, released in August, 2017. For more information, please visit Heritage Auction.